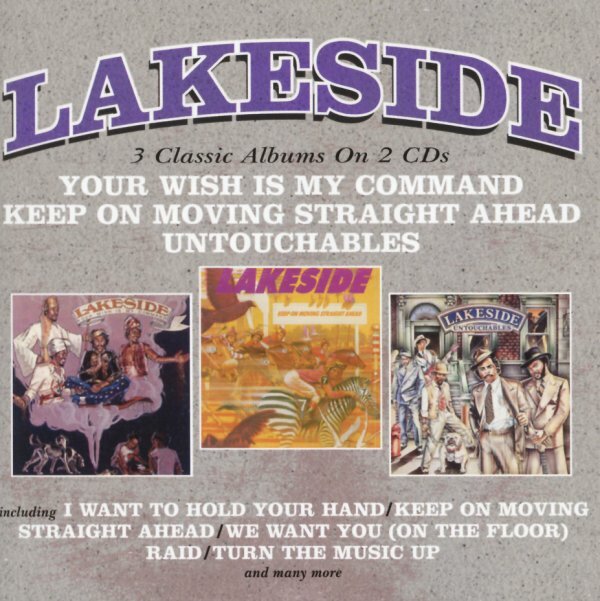 A trio of classic albums from Lakeside – representing the second slice of their work for the Solar Records label! First up is Your Wish Is My Command – great stuff from the glory days of the LA bass-pedal funk era! The tracks manage to mix an 80s groove and soul without sounding cloying, and the band's vocals are always better than we remember them – with a strong harmony sound in the best moments that keeps things real. Tracks include "Your Wish Is My Command", "The Urban Man", "I'll Be Standing By", "Special", and "Magic Moments". Keep On Moving Straight Ahead is a really well-titled album from the mighty Lakeside – as the record makes you think that the group were going to keep on going for many years – working in their own unique version of earlier funk modes – almost a tightening up of the Funkadelic style of the late 70s! The basslines are very much in charge, but like the George Clinton groups, they also have a great way of really bringing everything together at once – sly vocals, riffing guitar, sweet keyboards, and everything else that comes to groove – all hitting right on the money on titles that include "It's You", "Be My Lady", "All For You", "Anything For You", and "We Want You (On The Floor)". For Untouchables, the gangster image on the cover might be a tipoff to the sound – as Lakeside help forge the roots of g-funk with their classic bass-heavy sound on the album! The record's great – every bit as funky as previous Lakeside work in all the right parts, but also showing a greater development of the group past their funk roots – able to mix mellower moments with groovers, at that sublime level that Fatback hit when the 80s began! There's plenty of greatness here for everyone – and titles include "Real Love", "Untouchable", "So Let's Love", "Turn The Music Up", and "Raid". Bonus tracks include "Keep On Moving Straight Ahead (12" version)", "Raid (7" version)", "We Want You On The Floor (7" version)", "Turn The Music Up (inst dub)", and "Turn The Music Up (7" version)". © 1996-2019, Dusty Groove, Inc.